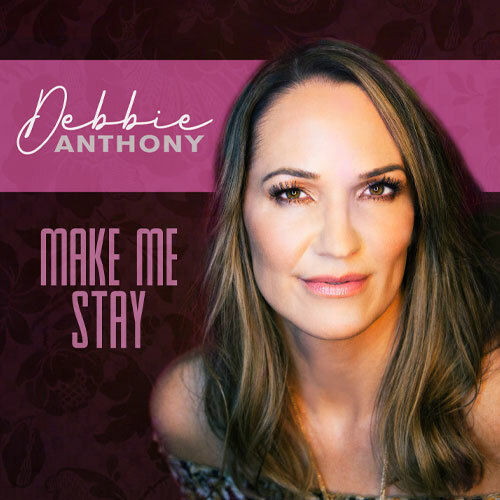 “Make Me Stay” by Debbie Anthony Premieres on The Country Note | 2911 Enterprises, Inc.
NASHVILLE, Tenn. – Adult-contemporary and country singer Debbie Anthony is excited to announce the premiere of her new song and video for “Make Me Stay” on TheCountryNote.com. Anthony delivers a rare combination of experience and emotion, with a voice that will satisfy and surprise true lovers of country music as she shares her soulful and honeyed voice through heartfelt lyrics. “I’m excited to share my heart in this piercing, emotionally-packed song about love and the elements that come with it––pain, passion, longing, and above all, hope,” Anthony explained. “Make Me Stay” is the first song being released from her forthcoming sophomore album, More To Be Said, due out Summer 2019. Recorded at MOXE, an airy, light-bathed studio and creative retreat on 20 wooded acres in Nashville, More To Be Said features some of Music City’s most accomplished and emphatic musicians, with fast-rising studio ace Gena Johnson (Ben Folds, Dave Cobb –– Chris Stapleton, Brandi Carlisle, Kacey Musgraves, John Prine, and more) helming the production. “Working with my incredibly gifted producer, Gena Johnson, and all the talented musicians, has been one of the most extraordinary experiences of my life,” Anthony concluded. APR 01 – KMNB Radio In-Studio Performance / Minneapolis, Minn.
APR 03 – Rochester Golf & Country Club / Rochester, Minn.
APR 05 – Forager Brewery / Rochester, Minn.
MAY 04 – Taco JED / Rochester, Minn.
MAY 10 – Five West / Rochester, Minn.
MAY 14 – ninetwentyfive / Wayzata, Minn.
JUN 08 – Five West / Rochester, Minn.
JUN 12 – 318 Cafe / Excelsior / Minn.
JUN 14 – Five West / Rochester, Minn.
JUL 28 – Down By The Riverside / Rochester, Minn.
AUG 04 – Meeker County Fairgrounds / Litchfield, Minn.
AUG 14 – Steele County Fairgrounds Park / Owatonna, Minn.
Debbie Anthony was born to make music. Raised in Minnesota, trained as a voice major at North Central University in Minneapolis, she drew inspiration from sources as varied as classic arias and Karen Carpenter. But after hearing Shania Twain, she knew that country music was her destiny. With her children grown, Debbie now steps into the spotlight with More To Be Said. This collection of classically crafted songs and strikingly distinctive vocals proves that her time has come — and, more than that, assures her a place among today’s outstanding country artists.